Christmas is a season most often related to parties and gift-giving. 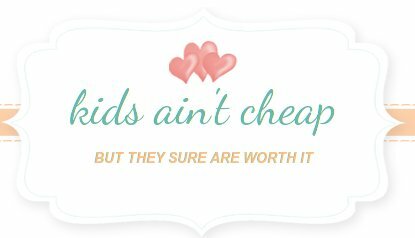 This is especially true for the little ones. If you have kids, and young kids like I do, you will hear a non-stop stream of Santa wishes the moment you put your tree up. I was thinking about this as I was decorating my tree with my son and daughter and I thought now would be as good a time as any to start teaching them about money. To be honest, this was a tough one for me There are so many schools of thought about how to go about doing this. When should you give your child an allowance, how much should this be, should you tie this to chores or not, and the list of questions goes on and on. I did some research and decided to try to combine a lot of what I thought made sense to me and I could actually apply. Carol Wilson, a financial adviser from Salt Lake City, says that children learn about money the moment you start taking them to the store. I found this to be so true. I’ve been taking my kids to the stores with me as soon as they were allowed by their pediatrician to venture out into the world and I must say my 5-year old knows all about buying food items, our grocery schedule, the fact that when I say “we have to buy more bread”, he knows that means a trip to the grocery store to pick out a loaf which will be paid for at the cashier. And my 3-year old is not far behind. 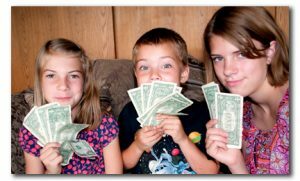 Now, I know that they know what money is and that it gets us goods and services (ok, services is stretching it, but you get the drift), I’ve decided to start teaching about the value of money. Ok, I’m going to do my best. This is not the easiest topic to teach. Identifying money. Make sure that she knows the difference between a nickel and quarter. Currency is different here in Manila but I get the gist of this point. My son knows the difference between all the bills and the coins but not the difference in values yet. Hmmmm….something to work on. Making change. Make sure that she knows how to present enough money to cover a purchase and to count her change. Ok, my son and daughter have very recently taken to buying a local tapioca and soy drink. A vendor passes by our house every morning and they come running to me for coins to make their purchase. This is a simple way to present covering a purchase and getting change. I’m happy about this. Being responsible for money. If she loses the dollar that was in her pocket, she has to know that it’s her loss (you won’t replace it). This will teach her to be more careful in carrying money. One morning last week, I gave my son some coins to buy his current favorite tapioca-soy drink. But the vendor didn’t come around that day and I didn’t get my coins back. The vendor did come the next day though and, like clockwork, both my kids came runing into the room to ask for change. So I asked my son where yesterday’s change was and he shrugged and said he dropped it. I told him that money was valuable and that he had to take care of it or he wouldn’t have any the next tiome he wanted to buy something. He didn’t get his drink that morning and seeing those big, fat tears almost made me cave. But he hasn’t misplaced his coins since. I’m hoping the lesson wasn’t too harsh. Understanding that things cost money. From the candy she eyes at the supermarket checkout counter to the premium movie channels on TV, she must know that nothing comes free. Well, the way I handle this is, every time we go out, I tell my kids that we can make 1 minor toy purchase only (if any). Antyhing they want after that has to go to the next trip becuase I only bring enough money for 1 toy each. I also try to teach them about caring for their toys becuase these cost money and can’t easily be replaced. The verdict is still out on both attempts to teach my young ones about nothing being free. Handling an allowance. Make sure that she learns to live with the allowance she’s given and to meet any expectations for it that you might set. For example, this may include a modest savings plan to pay for things she wants. 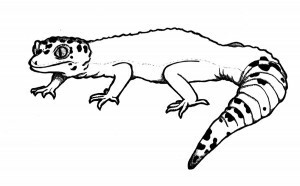 OK, I’m not sure about this part. I’m honestly not sure about how to introduce an allowance. So far, I’ve tried to connect chores to fun activities and rewards (rewards sometimes being the pride in a job well done). I’ve read that it is ok to connect chores to payment too as this will teach kids that they have to work for money. I am thinking that it might teach them that the only value in a job well done is its monetary equivalent. I haven’t decided. I do know I am going to give an allowance when they hit elementary but i’m still fuzzy on how to teach this. Suggestions anyone? I hope I’ve listed down some helpful suggestions for getting started on the money lesson. I guess at the end of the day, I really want them to learn that they need to understand and value money, that it IS important, but there are other important things too like going for excellence, and being cautious, etc. This is a work-in-progress for me so any other tips are highly appreciated. Have you explained money and value to your children? What prompted you to discuss it? Just a real quick post to wish everyone a very Happy Thanksgiving. Hopefully had a great time with family and loved ones and got to spend real quality time together. The older I get the busier I seem to become and the less opportunity I have to spend quality time with family so I cherish it whenever the opportunity presents itself and today was one of those days. What are you thankful about this Thanksgiving? 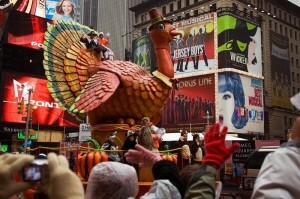 Thanksgiving Day is almost here and it’s one of my favorite holidays. I guess that’s probably because it revolves around; family, food, and gratitude — three of my favorite things! It is really important to my husband and I, that our boys grow up to be grateful for all of the blessings that they have throughout their lives. I know that being thankful for everything they have – no matter how much or how little – will make them happier, more compassionate, well-rounded, people. 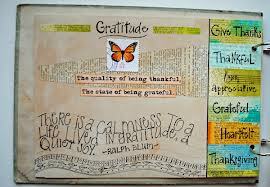 In addition, having gratitude will help them through the rough patches of life. So how does a parent go about instilling a sense of gratitude in their child? One thing you must keep in mind is children generally don’t gain a true sense of gratitude, until they are between the ages of 7-10 years old. If you haven’t noticed, little tikes tend to believe that the world revolves around them and that’s ok — it’s how they are wired. You just need to keep teaching and encouraging them and eventually it will click. Most kids learn to say “please” and “thank you” at very young ages; this is where they first start learning to express their gratitude to people. Each and everyday set aside time where you come together as a family and say what you are thankful for. In our family, we usually do this at dinner time and it has worked very well. Our boys really look forward to this time of day. Of course we always note how thankful we are for the food we are about to enjoy, but we also like to include; our family and friends, our pets, everyone’s jobs, our home, etc. Another thing you should – and probably already – do, is to express your thanks to your children. If your child does something without asking, be sure you let them know just how much you appreciate their help. I have been pleasantly surprised by my children when they have thanked me for things like; making dinner, finding a lost toy, or getting them a snack. Of course it doesn’t happen all the time but when it does – it warms my heart. Also, when your children receive gifts, have them make handmade thank you notes. This really shows the gift giver just how much your child appreciates them and of course – who doesn’t love getting a handmade craft from a child? It also teaches your child the importance of acknowledging a gift. Donate food to a food drive, homeless shelter, or food bank. Explain to your children that some adults and children don’t have enough food to eat and need help from other people. Take them to the store with you, and let them pick out foods they would like to donate. When you clear out closets and toys boxes, let you kids know where you are taking the items they have out grown. Be sure they know that these items are going to other kids who need and appreciate them. Think about what cause is closest to your heart; then get involved in some way. Donating your time can be just as important as a monetary donation. You can donate a little time or a lot of time but whatever you do, include your children whenever possible. During the holidays there are a lot of “giving trees” with gift wishes for needy kids and families. If you can, have your child select a gift recipient and allow them pick out a gift. This teaches your child the importance of giving to others and makes them feel proud that they were able to help someone in need. 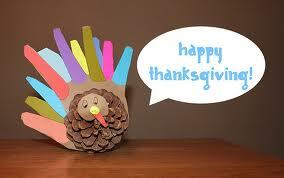 Thank you for reading and have a very Happy Thanksgiving!!! What have you done to teach appreciation to your children? As I have mentioned in previous posts, I have loved and enjoyed comic books for most of my life. Most people that have never been truly exposed to the medium lump them all into one category, childish superhero fantasy. While I am a big fan of superhero comics and find most modern superhero comics to be anything but childish, the point of this review is to show you that the medium of comics can and does tell a wide variety of stories. Comics, in the simplest terms, are stories told with both writing and art. 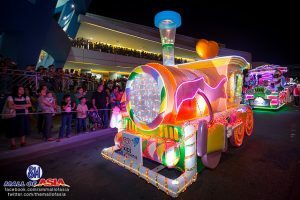 They cover a huge variety of genres and are aimed at an equally wide number of audiences and age groups. Owly is an independent comic book that is both written and drawn by Andy Runton. There is very little text in Owly. Mr. Runton uses expressive imagery to tell very emotional and heart warming stories. Owly vol 1 is the first comic book I bought for my children. Harrison was 3 and Sean was 1. Both were too young for it but they have grown into it since. Owly is not in the typical comic book format, it is shaped more like a standard book and much thicker than a comic. The first volume includes two stories: The Way Home and The Bittersweet Summer. Owly is an adorable owl who knows what it means to be human. He is a reflection of the sweet and innocent child in all of us. In the first story, Owly is lonely and in search of a friend. He is misunderstood by the other animals around him but he perseveres and in the end he learns the meaning of friendship. In the second story, Owly needs to learn how to let go but he also learns that goodbyes aren’t always forever. Both stories teach a valuable life lesson to children. As I mentioned previously, there is very little writing in Owly, it’s done almost entirely in black and white pictures but that is the beauty of it. The art is so expressive that it’s easy to take your child through the story and talk about what is going on in the panels. The book also allows your little one to express himself through the images, to create his own dialogue and explain to you what is going on. It let’s them use their imagination to tell a story that matches up with the images in front of them. My wife had a hard time with this book at first. The first part of the first story is heart wrenching, poor little Owly just wants to be friends but is rejected at every turn in the beginning. The art is so expressive it nearly brought her to tears the first time. If you can’t already tell, I highly recommend Owly. I reviewed vol 1 simply because it’s a good starting point but there are 5 volumes that I know of. 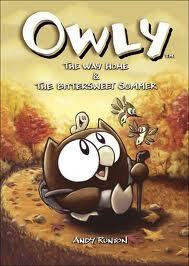 Owly is published by Top Shelf comics and may be available via your local comic book store. If you can’t find it locally, Amazon has it at a great price. Check it out for yourself at Owly Vol 1.